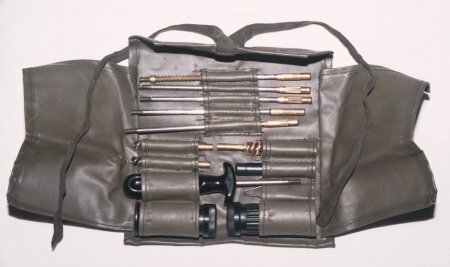 This cleaning kit was issued for the Stgw57 (aka PE57). The above phrase is a mixture of German and French. Thanks to Mark Adkins for IDing the proofmark. 1. Make the rifle safe. Remove the magazine and bolt. apply the grease to the bore and chamber area. 8. 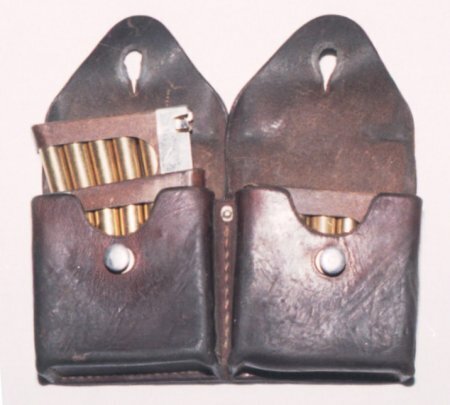 The magazine should be disassembled and cleaned as it accumulates firing residue. The 1911 and Cleaning kits below use a slightly different procedure. 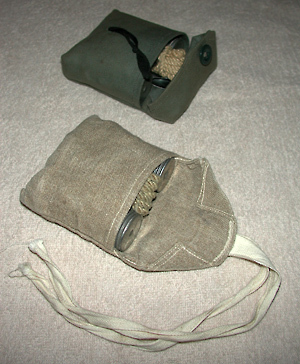 "Cleaning the K11 and K31: the cleaning kit consisted of 2 tins of grease, a chamber cleaner with a "sieve" ,spare "sieves" a string with an opening in the middle and a bore mirror and patches. 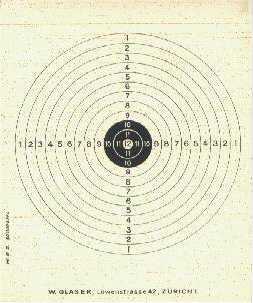 Before firing, you degreased the gun by running a patch through the barrel by means of the string. The patches were looped through the opening in the string. After firing you cleaned the barrel again with string and patches and then greased the barrel in the same manner. Occasionally we used the chamber cleaner and, in the case of rust in the barrel, ran a sieve through the barrel with the string. Usually it was a 2-man job, one holding the gun and one end of the string while the other held the other end of the string. The Stg. 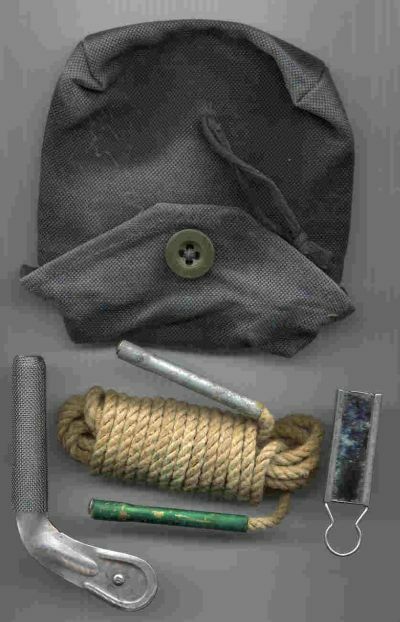 57 had a cleaning kit containing a rod (in sections), a brass brush, 2 tins of grease and an attachment to hold patches. In essence, the cleaning method was the same as above. No "sieve" though and it was a one man job." Above is a second type of cleaning kit. 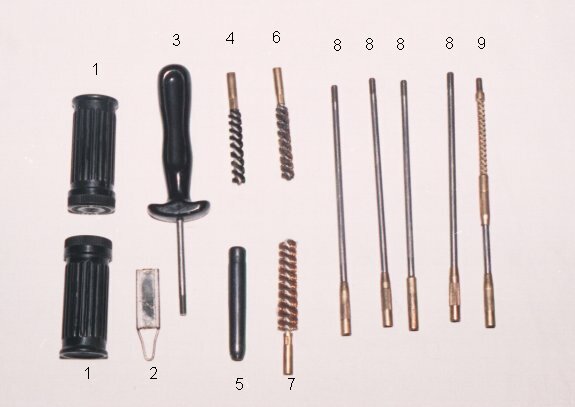 This kit uses a pull-through (middle) rather than a cleaning rod. 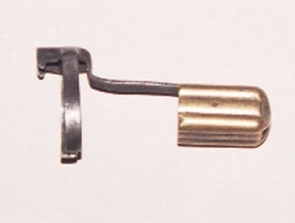 The the left is a chamber brush, and to the right is a bore mirror. The carrying case is at the top of the photo. This kit is intended for indoor or instructional purposes. 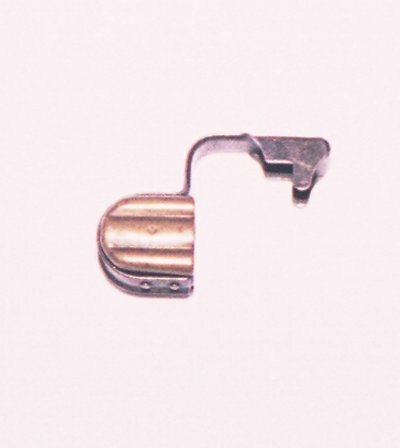 It consists of a chamber insert (1), a barrel insert. 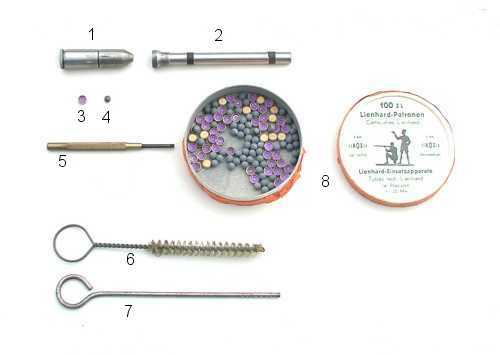 (2), primers (3), pellets (4), a screwdriver (5), a cleaning brush (6), a ramrod (7), a small carboard container to hold the pellets and primers (8) and a target (see below). 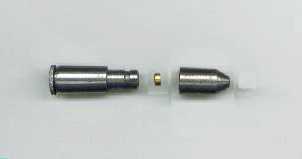 The assembly works by seating a pellet and the bore end of the barrel insert, then pushing the barrel insert into the chamber. Then, the top of the chamber insert is removed, and a primer is place in the cup. 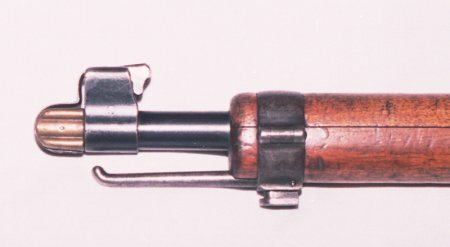 The insert is then chambered in the rifle. 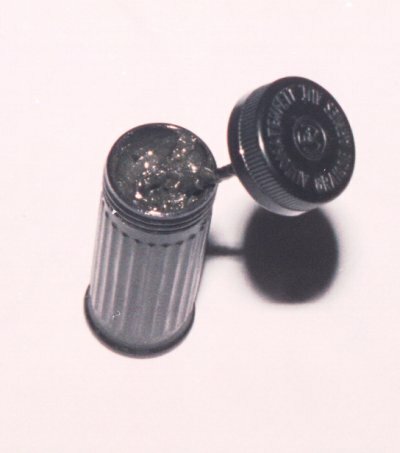 The practice pellet has a range of 5 to 20 yards. 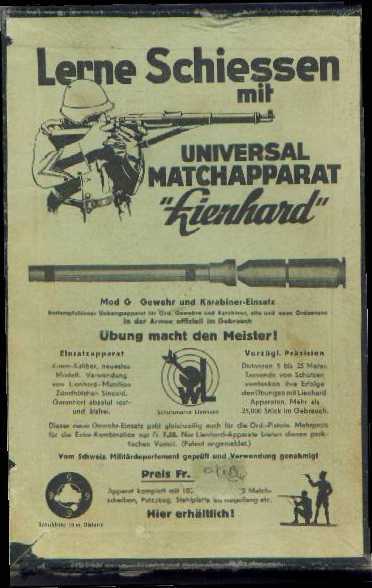 This cap fits the K31 & the 1911 Carbine.